Scented with mint and cumin, this hearty Turkish Red Lentil Soup is packed with vegetables and loaded with protein. Whenever we order takeout or go out to eat with the boys, we love going to ethnic restaurants. Not only are they often more affordable than American chains but the food is typically much more well rounded, balanced and nutritious than the standard kid-menu fare. 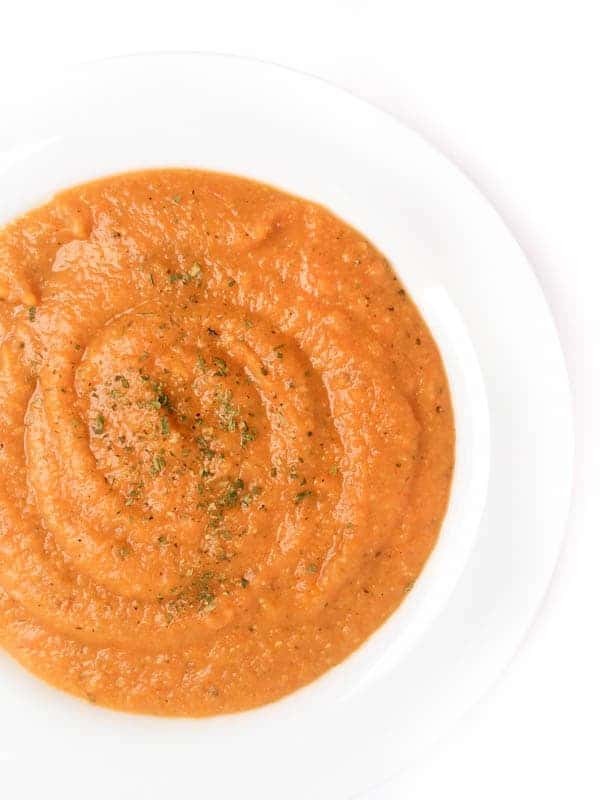 One of our go-to spots for dining out is a local Turkish restaurant that serves the most flavorful red lentil soup on earth. As the weather starts to cool down, we crave this Turkish red lentil soup more and more. So much so that I am constantly trying to recreate it at home so we can get our fix any time we want! 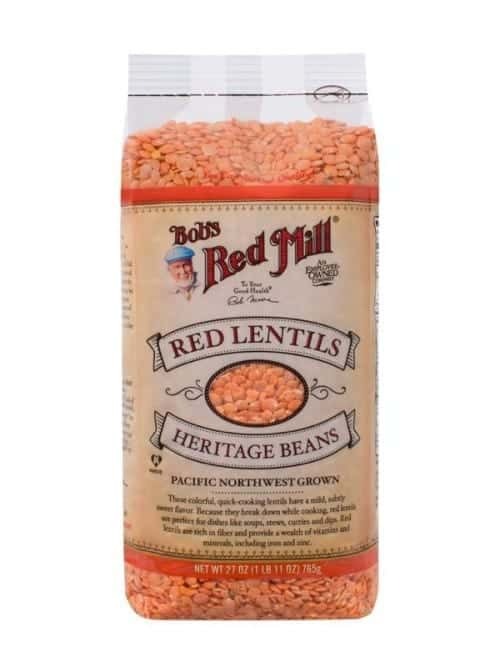 We always keep Bob’s Red Mill red lentils on hand for such cravings. If you’ve never cooked red lentils at home before you might be surprised to learn that they are fast cooking, much faster than brown, green or black lentils. In fact, you don’t want to cook them longer than 15-20 minutes or else they will truly break down to mush. After trying many versions of this soup at home, I think I finally nailed it. Creamy, yukon gold potatoes are sautéed with tender carrots and lightly scented with dried mint. When pureed together with the protein-packed red lentils, you are left with a warm and satisfying bowl of authentic Turkish red lentil soup. A pinch of cayenne and splash of lemon juice brings all of the flavors together at the end. Preheat a large stock pot over medium-high heat and spray with cooking spray (or drizzle with olive oil). Sauté onions and carrots, stirring frequently, until they begin to soften, about 4-5 minutes. Add potatoes, red lentils, cumin, salt and cayenne to the pot and continue sautéing for 2-3 minutes. 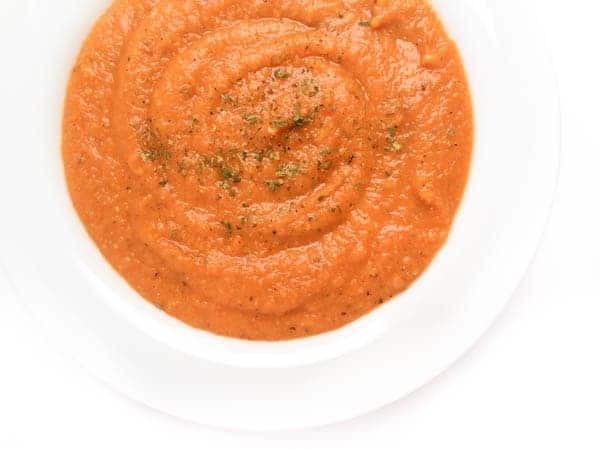 Using a wooden spoon, stir tomato paste into the pot and cook for 1-2 minutes so that the paste can absorb the flavors of the other ingredients. Pour in chicken broth, give the entire mixture a stir, then increase heat to high bringing the soup to a boil. and bring entire pot to a boil. Reduce heat to low and simmer until potatoes and lentils are cooked through, 15-20 minutes. Remove pot from the heat and add mint and lemon juice. Puree until smooth using a handheld blender. Check for seasoning and adjust accordingly before serving. Disclosure: I am honored to be in a long term partnership with Bob’s Red Mill. Thank you for supporting the brands that make The Lemon Bowl possible. All thoughts are my own. Be sure to check out my Soups board on Pinterest for even more tasty ideas! I like the colour of the soup. Hi Liz, I felt in love with lentil soup a while ago in Africa. I loved its vibrant color like any ethnic food. There were many variations of this soup but yours look very compelling. Thanks for reminding me about it. I’m so glad you like this type of soup!! Let me know what you think!! 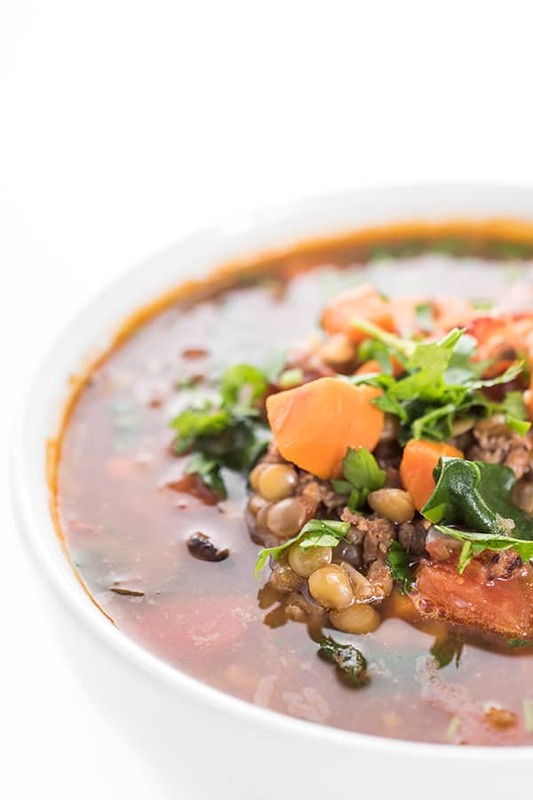 I adore lentil soups, especially when they’re all spiced up with my favorite flavors like this! Heck yes girl! Three cheers to fall foods! 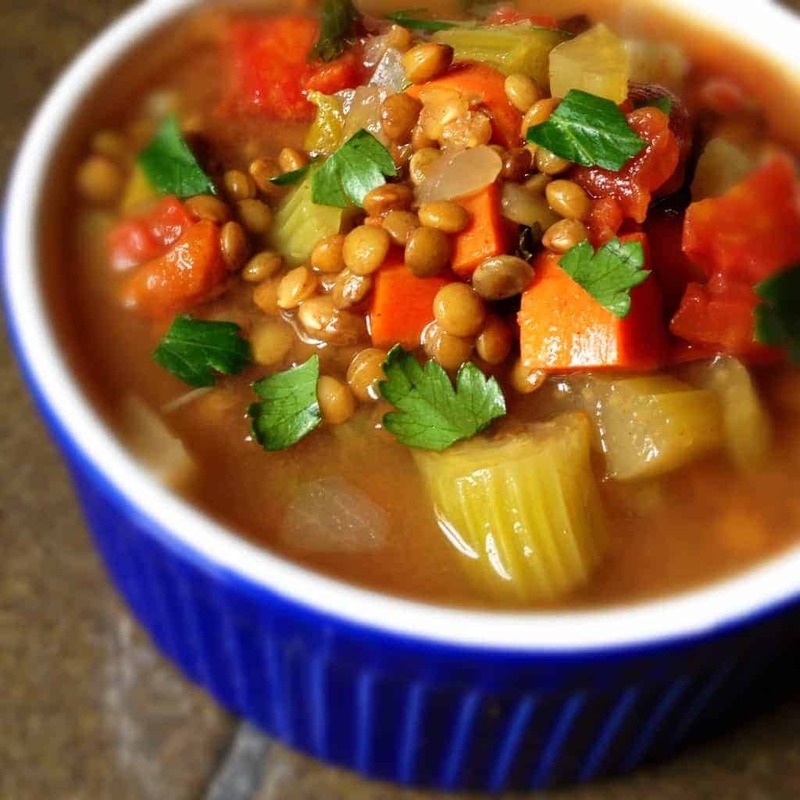 I love lentil soup, Liz, and can’t wait to try your version. I’ve made an Egyptian version that also uses red lentils, and it’s yummy. Here in San Diego it’s still very warm, so I’ll pin this for later and report back. Let me know if you try it Marlene! It’s one of our favorites! I can honestly say, I don’t think I’ve ever had turkish food before…Soups are my absolute favorite part of fall, and honestly, I eat them almost as frequently in the summer, so I’m always looking for new interesting variations. Love this! Oh my goodness it is one of our favorites! Now I want to have it tonight! Mediterranean flavah, lentils and potatoes? This is just one big ol’ pot of COMFORT. Is it wrong that I want to dive into this bowl and swim out? Hahah – not wrong at all girl! Liz, I will be in Grand Rapids and would love to know the name of the Turkish restaurant. Also any other favorites. I love your site and recipes. Hi Marcia – It’s called Zaytin in Ada! Highly recommend! I like ethnic food, going to ethnic restaurants as I’m convinced that it helps to diversify our palate. I like lentils and they are part of our daily menu but I have never tried red lentils before. You’ve inspired me to purchase a packet of them and prepare this soup! I hope mine looks as tempting as yours! I hope you love them Mariana! Let me know how it turns out! This soup has such a lovely, vibrant color! I love lentil soup. A big bowl of this would be wonderful on a chilly day! I love eating with my eyes first!! I know I would love this soup, totally my kind of flavors. I will be on the lookout for the red lentils! It’s comfort in a bowl! You would love this soup Megan! I fell in love with lentil soup while visiting my sister in Egypt. This looks delicious, love the kick of cayenne! Oh my gosh I bet the soup you had in Egypt was out of this world Brenda!